Inspections, Maintenance & Repairs--Precision Auto Inc. 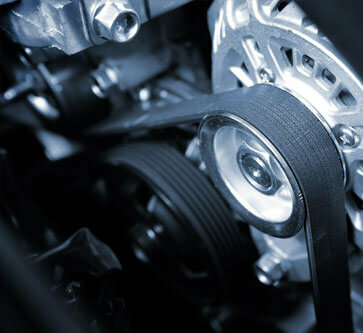 Your vehicle’s timing belt is vital to your engine’s safe operation. The moving, mechanical parts in the engine–camshaft, crankshaft, valves, pistons–are kept in sync with the timing belt. Owners should be aware of the timing belt’s condition and consult the owner’s manual for the manufacturer’s recommendations. Precision Auto in Germantown, MD will make sure your road travel is never interrupted by a timing belt malfunction. Our service technicians are able to spot potential problems long before they compromise your engine’s operation. When owners are not paying attention to the timing belt’s warning signs, they could find a surprise in the morning. If the timing belt has snapped, the engine will not start at all! Let us provide routine maintenance that allows us to inspect, diagnose, and service your timing belt. Keep your engine in optimal conditions at all times with our quality timing belt services. Our timing belt repairs are complete and accurate. We have experience with maintaining, replacing and repairing the timing belts for all makes and models of vehicles. The valves and pistons need to move in sync with each other to prevent them from colliding and causing irreparable damages. This is the duty of a quality timing belt. To keep your vehicle’s engine in excellent condition, the timing belt’s performance must be carefully monitored. Precision Auto customers are confident in their road travel because they’re never caught by surprise. Owners should remember that all timing belts will need to be replaced. The only question is whether you will replace it on “time” or after you’re forced to by a breakdown. When it’s time for a timing belt replacement, our team will also provide the necessary services that prevent future damages. It’s a good idea to replace the water pump and pulleys with your timing belt replacement. This is a preventative maintenance measure that protects the engine. We’re looking forward to your visit to our shop or your phone call. Be proactive and make sure our team of experts has the opportunity to address whatever’s happening under the hood. All we need is your vehicle and your trust to ensure quality performance from your vehicle’s engine. Timing belt replacement service is one of our specialties. Bring your vehicle to our specialists to make sure your vehicle is on the right maintenance or replacement service interval. Give us a call today at 301-428-3447 to schedule your timing belt replacement, inspection or repair service. You can also save time by using our convenient online scheduling system. Next time you’re in the area–12811 Middlebrook Road–feel free to stop by with any questions or concerns. We gladly accept all of our walk-in customers.